When crossed with thoroughbreds or warmbloods, Irish draughts produce a sport horse that excels at the highest levels of eventing and showjumping. This has been a double-edged sword: while Irish Draught lines remain popular with sport horse breeders, only 600 pure Irish Draught foals are being registered in Ireland annually, and mares aren’t producing replacements for themselves in the herd. The breed is classified as “endangered but maintained” by the UN. In an effort to preserve the traditional breed and improve genetic diversity, Horse Sport Ireland has introduced inspections of stallions and mares, grading horses on a 1-4 scale. There is, however, a great deal of debate among breeders and breed societies over the best way to ensure the survival these horses. On the other hand, the high-achieving progeny of Irish Draught stallions in showjumping and eventing has made those bloodlines desirable and the stallions prominent on the international circuits. These include King of Diamonds, who was 21st in the world breeding rankings between 1999 and 2001, the sire of successful showjumpers like Rodrigo Pessoa’s Special Envoy, Joe Fargis’ Mill Pearl, and John Ledingham’s Millstreet Ruby. They also include Sea Crest, a 1979 stallion who had 25 daughters and sons competing at the international level in eventing and showjumping. 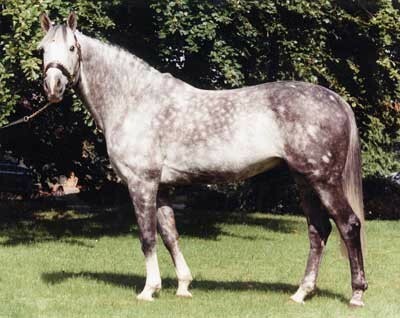 One of his offspring was Cruising (pictured below), out of an Irish Sports Horse mare, who won numerous grand prix showjumping competitions and went on to become a significant sire himself.